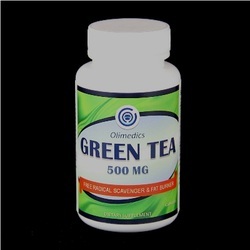 Green tea is a product made from the Camellia sinensis plant. Green tea is used to improve mental alertness and thinking. It is also used for weight loss and to treat stomach disorders, vomiting, diarrhea, headaches, bone loss (osteoporosis), and solid tumor cancers. Green tea may also be effective in help treatment in cervical dysplasia, coronary artery disease, endometrial cancer, low blood pressure, oral leukoplakia, osteoporosis, ovarian cancer, and Parkinson’s disease. This product contains 15 mg of caffeine per serving. Active ingredients: Green tea extract.